Girl's Gone Child: "Use this speech as a resource." In her speech 18-year-old Nadia Goldman says, "It doesn't matter if you can hear this speech because I know that I am speaking." But I hope you will HEAR her. "Parents, stop invalidating anger as childish, allow your children to say no, teach your sons what respect and consent means, support your children in whatever life they choose for themselves. 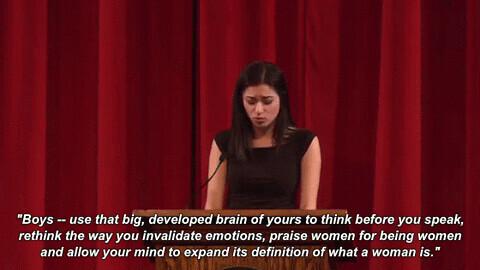 Praise women for being women and allow your mind to expand its definition of what a woman is."